Hills has come a long way since Edward Hill started his one-man business manufacturing bricks in 1900. Based for most of the last century in Swindon, the company expanded into haulage, quarrying and eventually waste management. Edward could hardly have imagined that, four generations of his family later, the business would have evolved into a multi-million pound operation, harnessing the latest technologies, pioneering major infrastructure projects such as the Northacre Resource Recovery Centre (Wiltshire’s first mechanical and biological waste treatment plant) and employing nearly 400 people across western and southern England. Hills is proud to provide jobs and homes for local people, supply materials for the construction industry and contribute significantly to the regional economy and local communities. 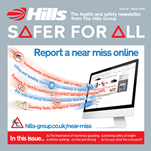 Hills also care passionately about the environment, and about minimising any impacts on its neighbours. While there have been many changes since 1900 the same qualities of energy, enterprise, affability and confidence with which Hills was founded, still characterise it today. Hills’ people remain the greatest asset of the business as it looks confidently to the future. Click here to read the story of 116 years of the Hills family business.